" The foam is very comfortable and I don't feel claustrophobic "
" I'm very happy with the mask. Fits better than my previous mask, no air leakage and quick delivery. Would definitely purchase again. " The AirTouch™ F20 For Her Full Face CPAP Mask with Headgear is an updated version of the AirFit™ F20 For Her that includes a memory foam cushion instead of the traditional silicone. The foam cushion is intended to be replaced every 30 days. The AirTouch™ F20 For Her features violet color accents instead of blue. 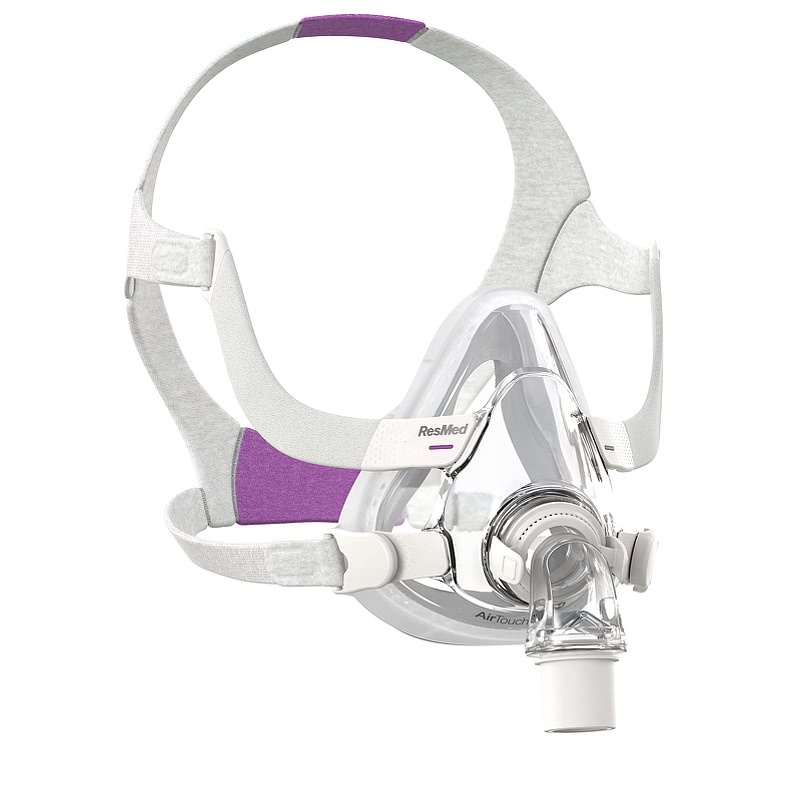 As of June 2018, ResMed now includes the QuietAir Elbow on all F20 masks, which is 89% quieter than the previous elbow. 4% of Full Face Mask product buyers choose this product. The AirTouch™ F20 For Her Mask is an alternative version of the AirFit™ F20 For Her mask and uses a foam cushion design intended to provide a more effective fit and seal. This is a full face mask that covers the nose and mouth. The AirTouch™ F20 For Her's cushion has a layer of memory foam that is intended to provide a much better fit and seal in comparison to traditional silicone. Unlike traditional silicone masks that can be washed daily and used for 3-6 months, the foam cushion should only be wiped and not washed, and replaced every 30 days. The For Her version of the Airtouch™ F20 mask contains violet color accents in place of the blue found on the standard version of the mask. 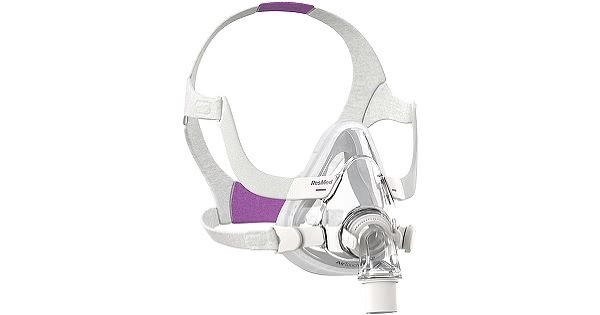 The frame has violet color connections where the clips connect and the mask headgear has two violet sections, one on the top and one on the back. Because the AirTouch™ F20 For Her uses the same frame and headgear as the Airfit™ F20, the cushions between the two are interchangeable. The AirTouch™ F20 For Her mask has easy to use components to assemble and disassemble the mask. The magnetic headgear clips snap the headgear onto the frame and the elbow has tabs to remove it from the frame quickly. The elbow also has a large number of exhalation ports which diffuse the outward airflow for quieter operation. ResMed has developed a new QuietAir Elbow for the F20 Series of CPAP masks which is 89% quieter than the previous elbow. This is included for free with your purchases of this mask. Unlike silicone cushions that can be washed daily and used for up to 3-6 months, the UltraSoft™ memory foam cushion cannot be washed, only wiped daily with an alcohol free mask wipe. Do Not allow the memory foam to get wet. The cushion has a suggested replacement time of 30 days. The AirTouch™ and AirFit™ F20 masks use the same frame and headgear, meaning their cushions are interchangeable. The frame and elbow should be washed daily in warm water with a mild detergent. Use a soft brush to clean the components if needed. Rinse well and allow to dry out of direct sunlight. The headgear should be hand washed weekly in the same manner. The cushion can be wiped daily but cannot be washed and should be replaced every 30 days. The AirTouch F20 cushion should not be placed inside of an ozone cleaning device as it can result in damage to the cushion. The cushion should only be wiped daily only.